This month, the UK is moving to change its laws to stop the export of used televisions. You know, the used TVs which make up 70% of sales in African markets, which created about 7 million households with TV in Nigeria. And the CRT computer monitors, which Africans used to set up the internet cafes which led to the Egyptian Spring. In about 10 days, new regulations will come into force to explain the 2009 arrest of an African, Joe Benson, who sold the TVs before the laws were changed. You could call it "tying up a loose end". But there's another loose end to attend to. Last month, Basel Action Network publicly disavowed the "80% Export" statistic in response to a Bloomberg editorial (Adam Minter). Also, BAN Executive Director Jim Puckett applauded this UNEP study. Sounds a lot like "Fair Trade Recycling". So how does BAN balance the UN Study, showing 91% reuse, recommending AGAINST laws like CAER's Green-Thompson bill, with its applause for the crackdown by Interpol and Europe on exporters like "Hurricane" Joseph Benson of BJ Electronics? First, embrace the study. Second, take credit. "I am very satisfied with the quality of the UNEP studies. I know well the authors and have worked with them and discussed findings with them. These studies were funded due to our film Digital Dump which was shown at the Basel meeting whereafter the EU donated 1 million Euros to assist Africa in solving the e-waste crisis. "Nigeria was faced with a very serious abusive importation scene when we first arrived in 2005. They took the appropriate action and Nigeria is one of the great success stories of addressing the e-waste crisis. In China it has worsened, in Nigeria, they have really exercised control over the egregious toxic e-waste trade impacting their environment. " This is Jim Puckett's spin on the UNEP study, which took 279 sea containers in Nigeria (104 of which came from Joseph Benson's adapted country, the United Kingdom). The researchers pieced all the TVs out, and found 91% reuse rate. He tries (in the second quote) to take credit for the turnaround. In fact, BAN was very, very busy in 2009 and 2010, the period when the 91% reuse was documented in the UNEP study. Here is a report from the University of Northhampton (UK) which uses BAN as a source, stating only 25% of what Nigerian techs imported could be fixed or reused - complete with photos by master photographer Jim Puckett himself. What a terrific turnaround it is, from only 25% reuse to 91%. So fast a "turnaround" that the innocence/improvement happened before the crime! Here is the infamous 2009 Interpol report, which uses the same (or similar, they never seem to be exactly the same) statistics from BAN's "study" on the percentage of waste in African used electronics exports. Did Puckett notify Interpol that it was actually much better in 2009? No. BAN issued a press release, referring to the Africans as "Organized Crime". And the source of Interpol's data on the extent of the dumping - MSU - cites who else? 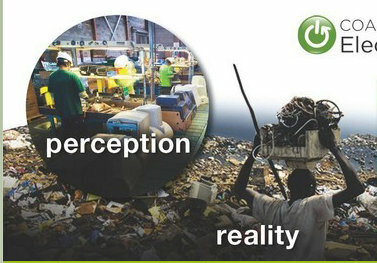 BAN, their report that 80% of exports of CRTs are for primitive recycling. But perhaps BAN took credit for the turn-around in their 2008 - 2010 reports? Nope. Take a look at the 2009 Basel Action Network annual non-profit report. Look at the pictures of African kids festooned on the cover. This is 2009, not 2005. 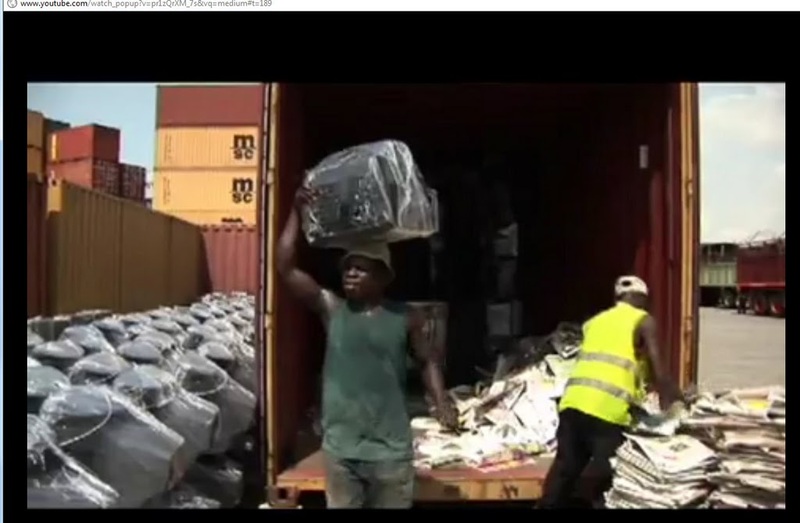 And the containers were sorted by the UNEP researchers just weeks after the 2009 BAN report was issued! Here is Milmo again, crowing over the arrest of Joe Benson in November of 2009, weeks before BAN's annual report was published with the photos of the African kids. "Tonnes of defunct electronic equipment sent from Britain to countries including Ghana and Nigeria ends up each year on waste dumps where "scavenger children" pick through the detritus looking for bits of wire, circuit board and cathode-ray tube. The precious or heavy metals in the components can be extracted by setting light to their plastic and glass coatings but that produces a dense cloud of potentially toxic chemicals." So there you have it. The UNEP study was done during the highest heat-of-the-crusade. Cahal Milmo linked up to BAN in February 2009, and set up a "sting" of Joseph Benson, who is arrested in November 2009. BAN puts a link to the UK Independent article on their website, and publishes it as a coup in their 2009 Annual Report on what the 501-c3 (non-political, charity) non-profit spends your e-Steward money on. Championing legislation on the backs of kids in photos, who don't get a dime I can see anywhere in that annual report. 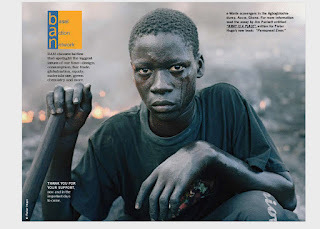 BAN is white hot after the Africans, like Joseph Benson and Hamdy Moussa, right up until the sea containers in the UNEP report first begin to get sorted. Follow the links. Jim is applauding the 2010 study which investigated the same seized containers in Lagos and found 91% reuse. And he claims in the Bloomberg comments to have had nothing to do with the 2009 Nigeria Sting of Benson in London. But the containers the UNEP studied were Benson's containers, and Benson was set up by SkyNews and Cahal Milmo, who used BAN photos and citations in February 2009, and worked with Jim's previous employer, Greenpeace. They sabotaged a good looking TV and hid it in Benson's container. But they never let Benson's repairpeople in Lagos try to fix it, they seized it back in Lagos. Then they took pictures of the landfills outside of Lagos, a city with 25 times as many TV-owning households as Vermont. So if the waste photographed at the Lagos dumps did NOT come out of Joe Benson's sea containers, where did it come from? 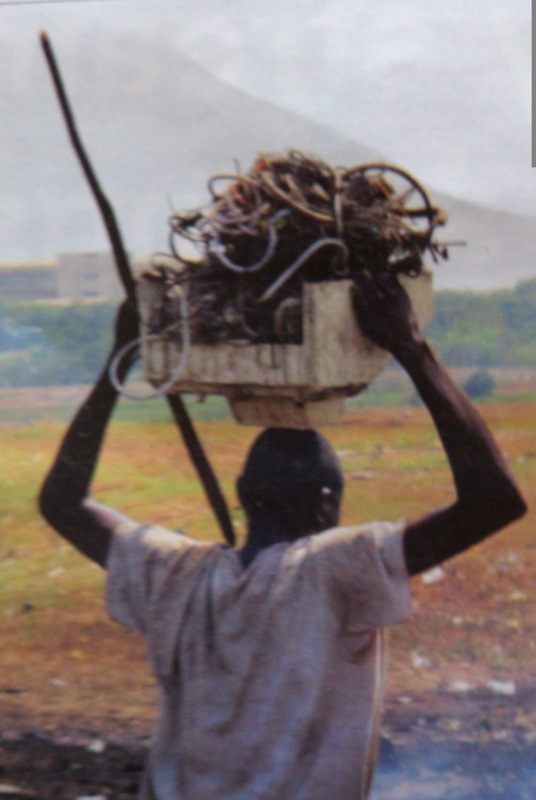 Take a tour of the "Scary black people" photos in the Halloween blog... look closely at the TV the scrap boy carries at the dump, and the TV in the 1977 Nigerian singer's album cover, and the TVs shown unloaded in the Greenpeace video. World Bank data shows that Nigeria had 6,900,000 households with televisions in 2007, the year after BAN's Digital Dump escapade. Now, my home state of Vermont has 256,711 households (let's assume 100% have a TV). And the UNEP researchers, the ones Puckett compliments, are also the source of this statistic: Most of the material shown scavenged at the dumps in generated by Nigerians themselves. My company collected over 5 million pounds of e-waste from Vermont last year. So if Nigeria has 6,900,000 households with TVs, that's more than 25 Vermont's... possibly generating 25 times Vermont's E-waste. THAT, according to the United Nations, is the source of most of Nigeria's "scrap boys" material. This is a simple and obvious case of defamation of the man, Joe Benson, by the "environmentalist" organizations BAN and Greenpeace. They STILL raise money with the story of stopping the E-waste trade in Africa, and STILL put Joe Benson's arrest stories on their websites. We are trying to raise money to hire Mr. Benson a lawyer. The sting was partly paid for by SkyNews, which is owned by Australian billionaire Rupert Murdoch. Greenpeace Europe, which participated in the Sting, is Jim Puckett's former employer (before BAN). And it continues to this day. Even while BAN's Puckett is trying to distance himself from accusing Nigerians of importing waste, saying it was a 2005 problem. Even now, "documentaries" are appearing on youtube. Check this one out, posted two months ago. This is criminal environmental malpractice. What's BAN's next move? Watch for a report with Electronics TakeBack Campaign (etbc), working with former BAN employee Lauren Roman (now of Transparent Planet). They are still addressing these huge piles of CRT glass around the USA. CRT glass from televisions. You know, the ones which, it turns out, were not exported to Africa after all. Jim is turning his camera onto the piles of glass created by the shredders which embraced the Anti-Export legislation Jimbo espouses, and which Nigeria's researchers warn us against. He will survive by cannibalizing the OEMs and shredders which followed him down up the Donner Pass of bad data.